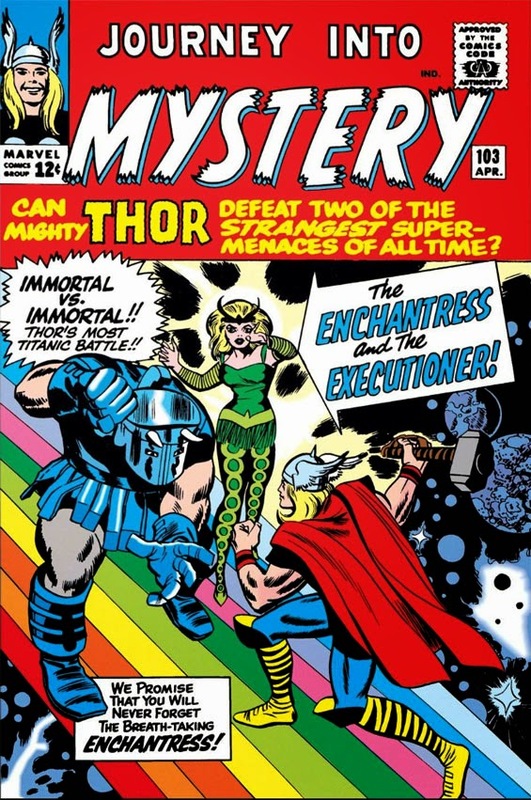 It's pretty easy to figure out why the Executioner came running whenever the Enchantress beckoned, other than the fact that it meant a devilish scheme was at hand. But what set in motion their enmity toward Thor? 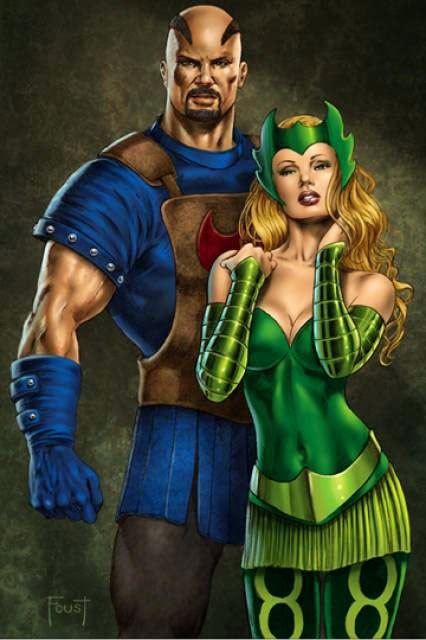 What set them on the path to mutual villainy? 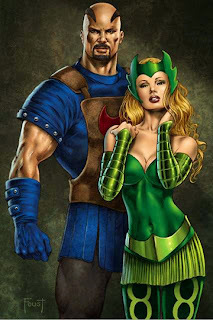 How did these two Asgardians become partners in crime? OR: "The Wizard Slips Up!" 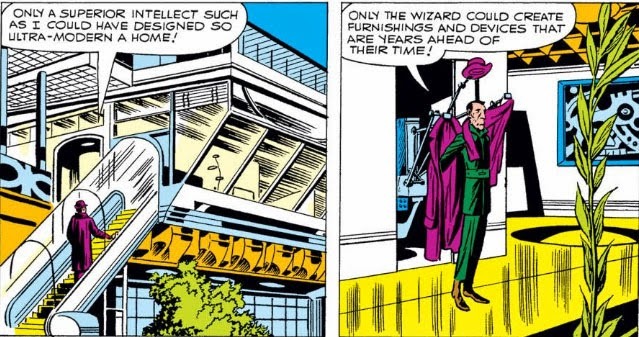 Not that the Wizard doesn't make the occasional blunder. 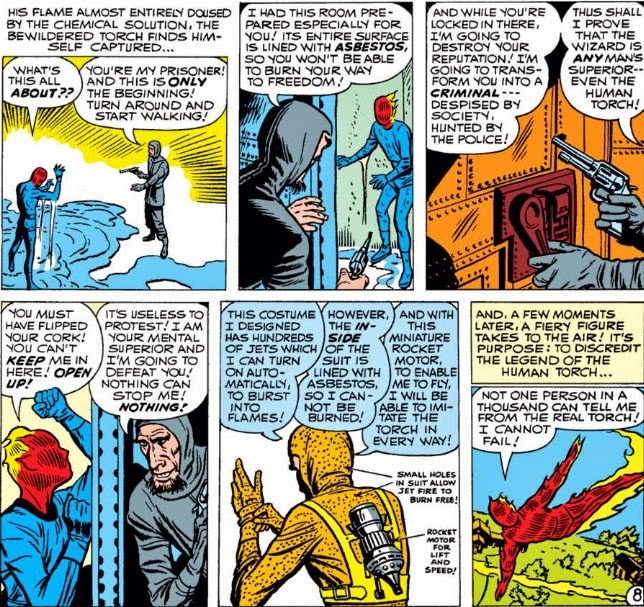 Not many escapees head back to their residence after breaking out--but that's just what the Wizard does, and the law quickly tracks him down and surrounds the place. 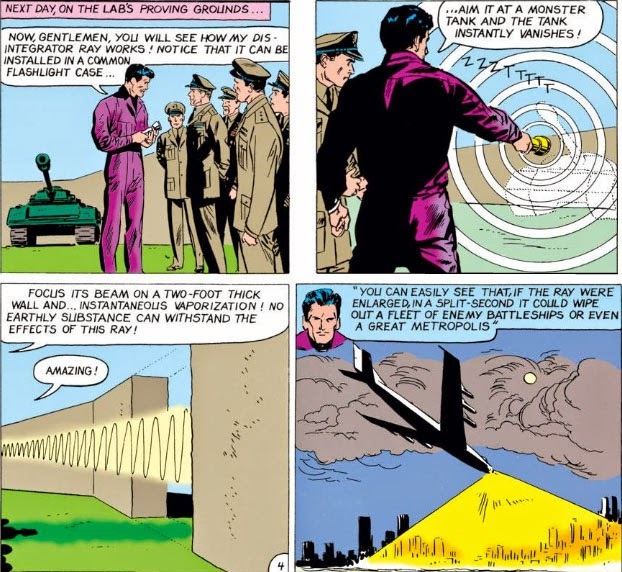 But that's all they can do, because the Wizard has thrown up a force field to prevent their access. 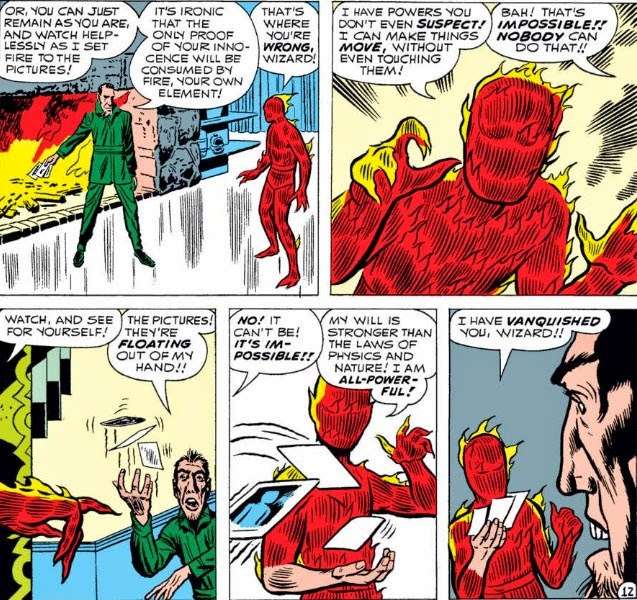 So you might think this all comes down to a standoff--but the Wizard moves immediately to business, and challenges the Human Torch to a rematch, which the Torch accepts over the protests of his sister, the Invisible Girl, who chides him for using his power to settle a vendetta. 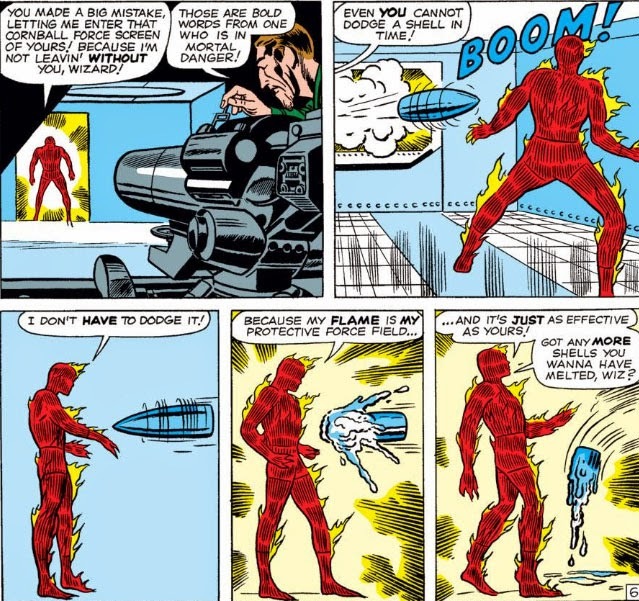 Yes, it seems you can indeed make functioning equipment out of only fire. But PLEASE DON'T TRY THIS AT HOME. At least now we know where the Wizard got the inspiration for that helmet of his, eh? Yikes! 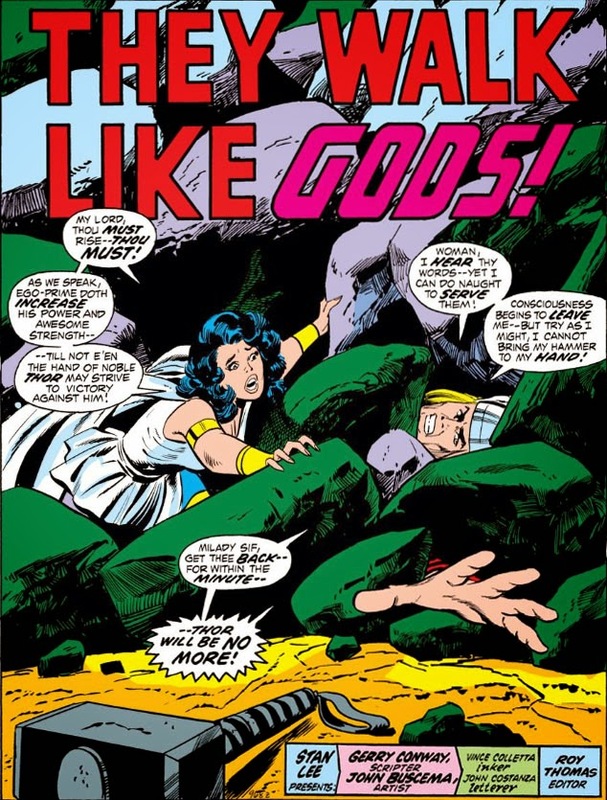 With the attack of Ego-Prime, and Earth on its way to becoming so much rubble, it looks like the monster is already putting some of that rubble to good use: ending the life of the god who stood against him! Though Ego-Prime obviously poses a threat to the entire planet, Conway (as well as artist John Buscema) has held back in making it clear as far as his effect on the planet thus far. We know that New York, at least, is now in ruins; and when the story reaches its climax, we'll learn the extent of the devastation has occurred on a global scale. Unfortunately, with everything that's being crammed into this story's conclusion, there's little to no room in the 20 pages they have for Conway and Buscema to depict those scenes--and that's regrettable, since Ego-Prime's attack on the world deserves to have more impact than just the creature's bold and arrogant words of its intent. 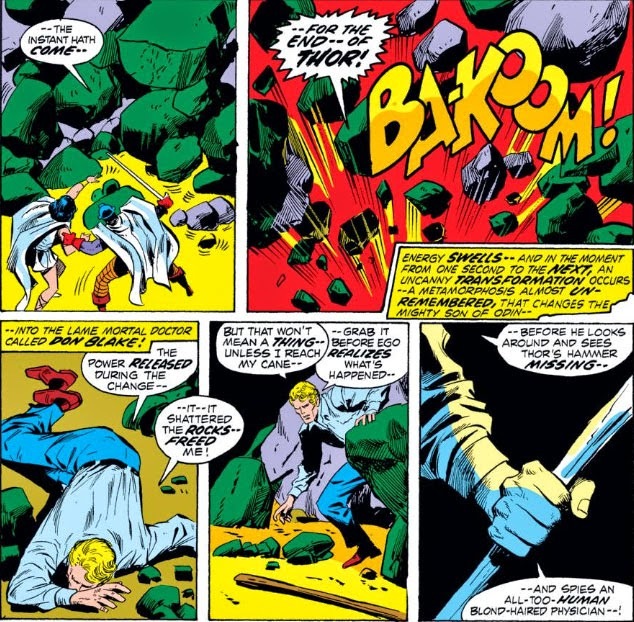 Thor's change to Blake manifesting as a violent reaction seems to be a matter of whether or not Thor is in a deadly predicament at the time (which has also been the case with Blake's change to Thor). One could argue that the change produces a violent effect if Thor isn't using his hammer to control the change, though we've seen otherwise in such instances over the years; and of course here, buried beneath tons of rubble, the frail figure of Blake would have been instantly crushed had the change not resulted in blasting the boulders away. 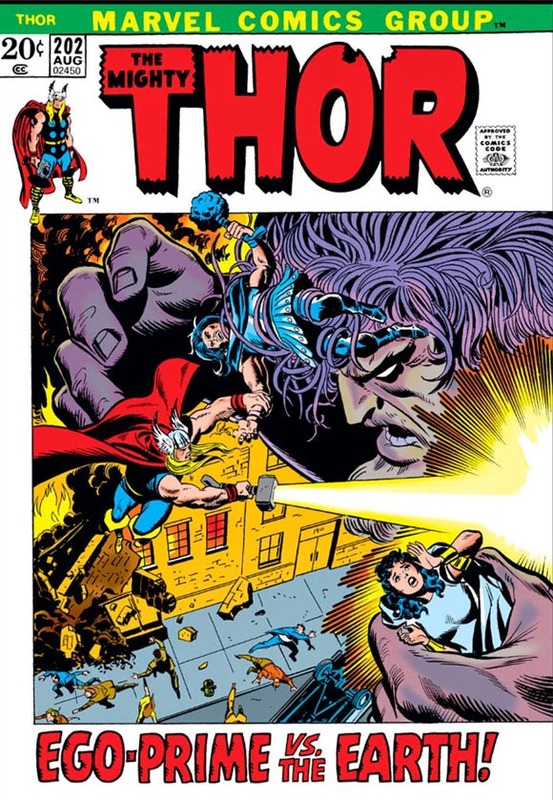 Regardless, when Blake immediately makes the change back to Thor, it's time to kick this story up a notch--because Thor is ready for Round Two with Ego-Prime! 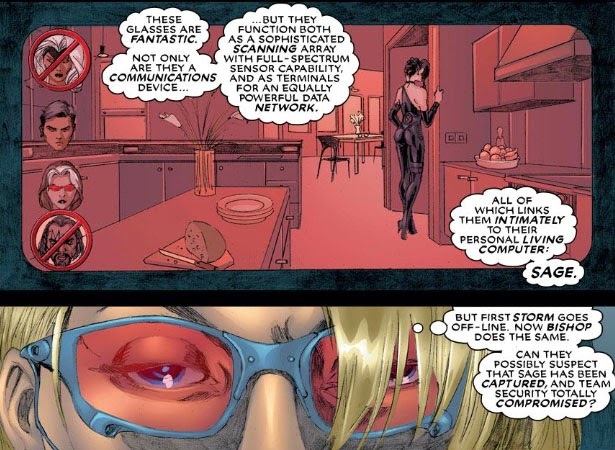 Mainly a communications device, the team's sensor shades also provided near-instantaneous scanning and diagnostic information, in tandem with analysis from fellow team member Sage (a/k/a Tessa, former aide to the Hellfire Club's Sebastian Shaw). Of course, they weren't a bad fashion statement, either. 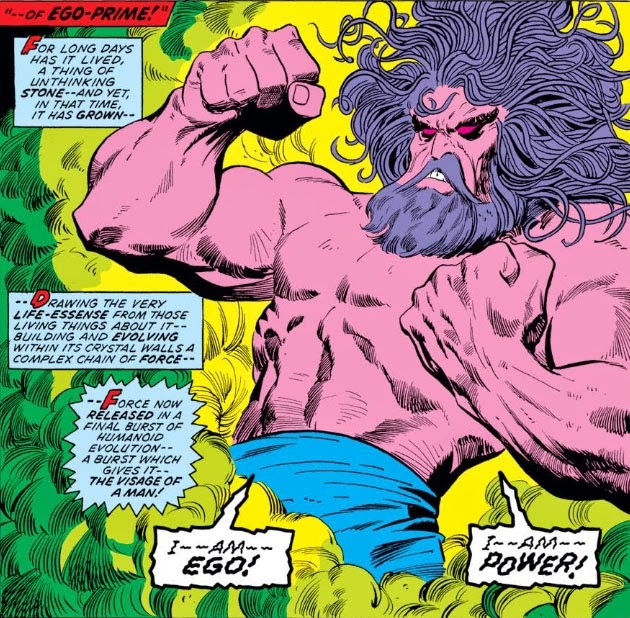 None Dare Stand 'gainst Ego-Prime! 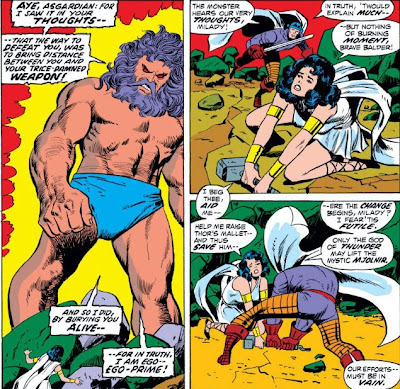 Even before Asgard returned from the edges of space/time after the realm's forces faced Pluto and his hordes, its ruler, Odin, had launched one of his intricately woven plans in order to accomplish a goal for the greater good (or at least Odin's idea of the greater good)--its timetable perhaps accelerated due to the looming threat of Mangog and the feared destruction of Asgard. This plan would turn out to involve several people, all unknowingly and independently assembling the pieces of Odin's scheme--and in the end, it would have grave consequences for the people of Earth, if only for the duration. 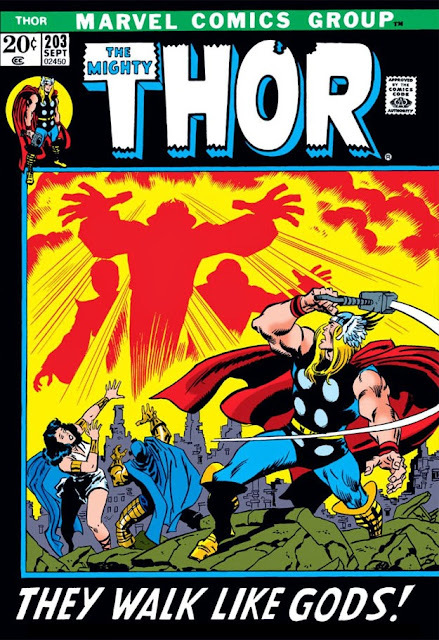 The consequences for Odin's son--Thor, the God of Thunder--would be another matter, and would not be remedied so easily. But for readers of Mighty Thor, the two-part conclusion to this saga--published in late 1972 and written by Gerry Conway--would cap a heck of a ride, a story involving many elements and which would have repercussions which would reach all the way to Thor #300. But don't jump ahead just yet! Because it's important to keep in mind that Conway had written these events without the foresight of what the end result of Odin's plan would portend for that 300th anniversary issue, eight years ahead--and if taken on its own merits, his story here is perhaps all the more remarkable in its depth. So, one step at a time, shall we? It's the one part of Conway's story that doesn't hold water. Sif, not a scientist by any means, has no basis to believe that Blackworld's evolution has any direct connection with Earth beyond the fact that its evolved humanoids look like 20th century Earthlings and have developed a culture that resembles that of Earth; yet she implies that Ego-Prime's actions here will spell disaster for Earth, as well, when Blackworld's timeline matches that of Earth. However shaky such a conclusion is--and Conway never proves it to be otherwise--it soon becomes moot when Blackworld reaches the point of nuclear conflagration. 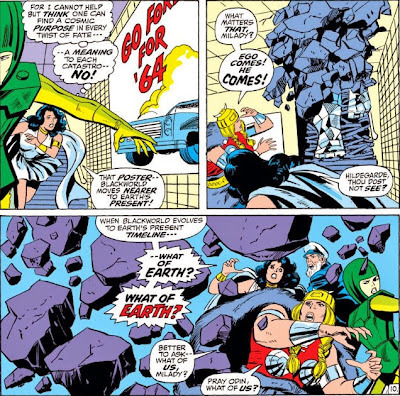 And with the blinding flash of Blackworld's presumed end, Sif and her party appear on Earth without explanation. 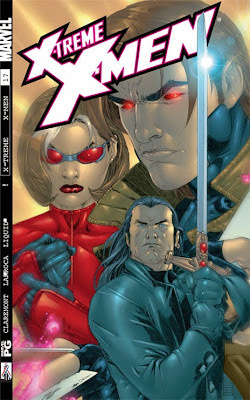 Whoa, Ororo! Who's talking about abandoning or sacrificing Locke's hostages? Wolverine speaks of saving the hostages and abandoning Arcade (and, if he has his way, making sure Locke's days of kidnapping are finished). 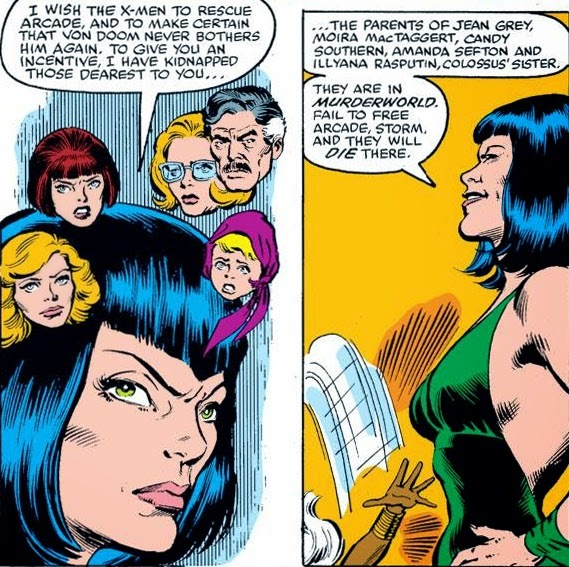 In effect, Storm is amending Wolverine's proposal by splitting the team, for reasons which don't make sense: One group breaks into Murderworld and rescues the hostages, while the other team negotiates with Doom for Arcade's release. 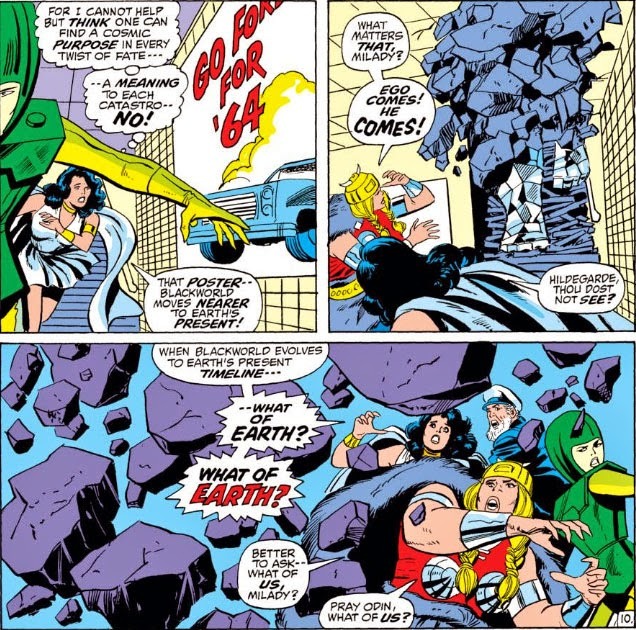 To make matters worse, what Storm fails to make mention of in this panel is the fact that her group's purpose is not to secure Arcade's release without a fight--it's to infiltrate Doom's fortress and actually break Arcade out of his cell, while Storm meets with and distracts Doom. 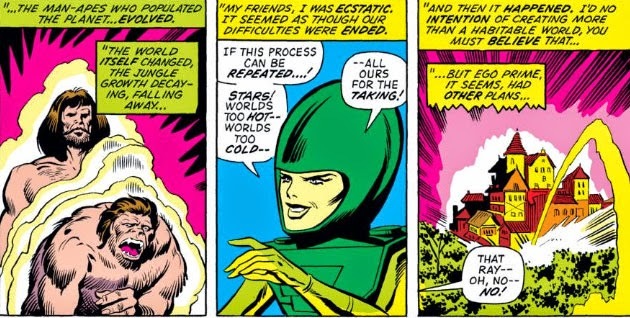 In other words, Storm gives writer Chris Claremont what he needs to make this into a three-part story--and for what? 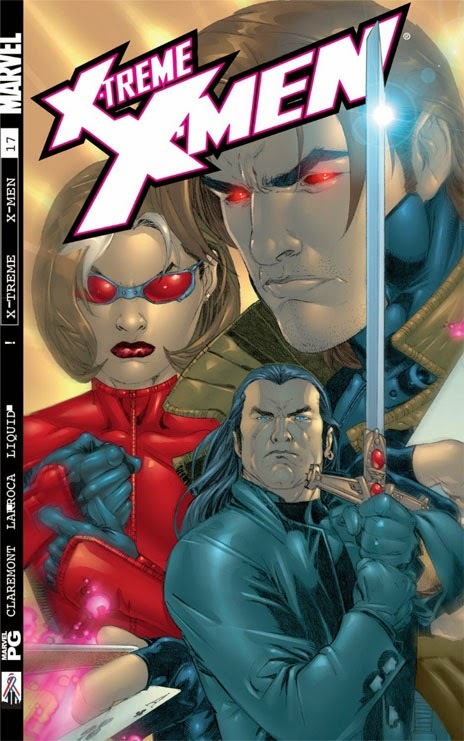 Why should the X-Men care about Arcade's affairs vis-à-vis Doom, or that Arcade has fallen into Doom's clutches? It's Locke who is the enemy to overcome here, isn't it? 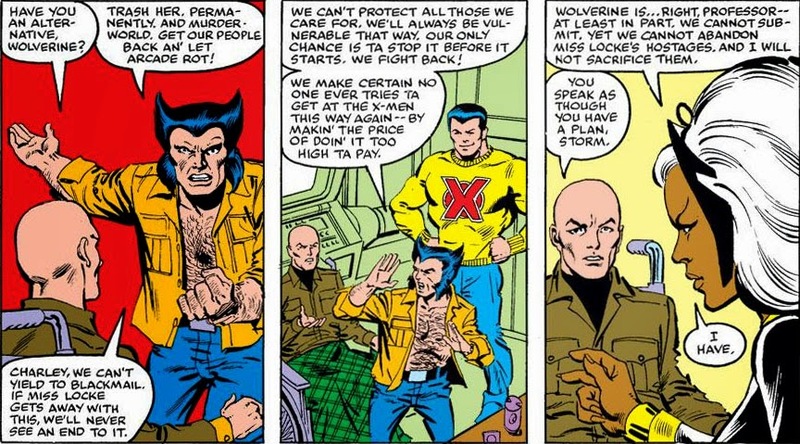 Let's break down Storm's "stormtrooper" plan: If Storm agrees with Wolverine insofar as rescuing the hostages, why bother with Doom at all? 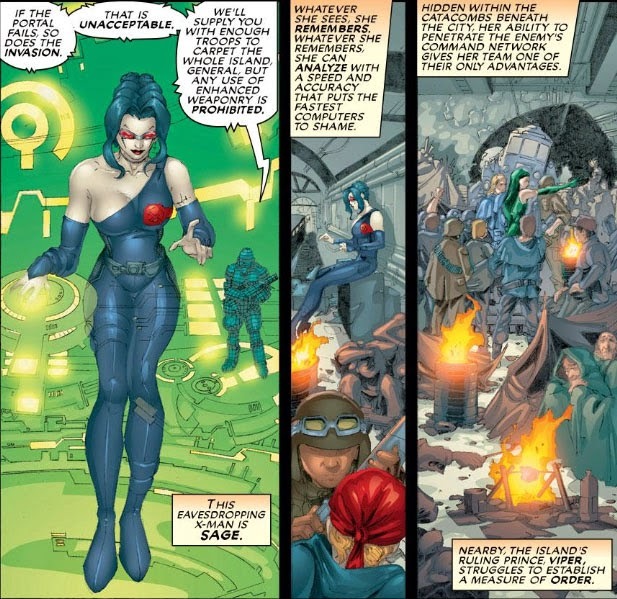 And if her team is breaking Arcade out of captivity and complying with Locke's demands, why invade Murderworld at the same time? Tony Stark may have had lucrative defense contracts in the years when he was exploring his new life as Iron Man, but, munitions and weapons manufacturing aside, you have to hand it to the man for always thinking outside the box. 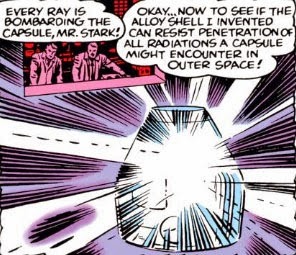 You could definitely say the same for Reed Richards, yes--but, with his resources, Anthony Stark was the go-to guy for getting things designed and off the drawing board and into productivity. ...but when did he find time for a crash course in biology? A great idea, assuming your troops have the luxury of highways to whoosh along on--and I'd bet they can probably be heard a mile away by the enemy. 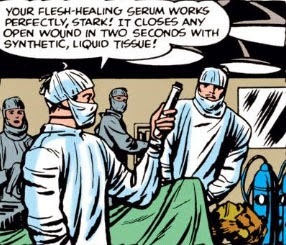 Uh--Mr. Stark? Dude? 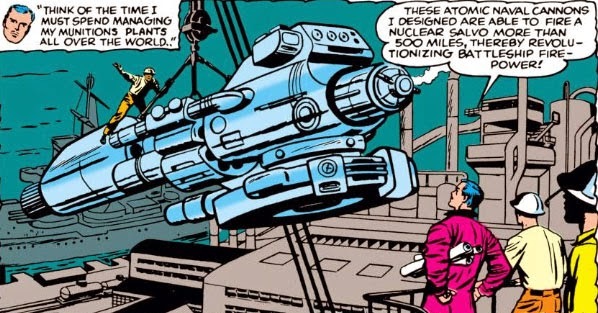 Nobody was firing nuclear salvos, even in the trigger-happy '60s. The goal was not to fire nuclear salvos, remember? 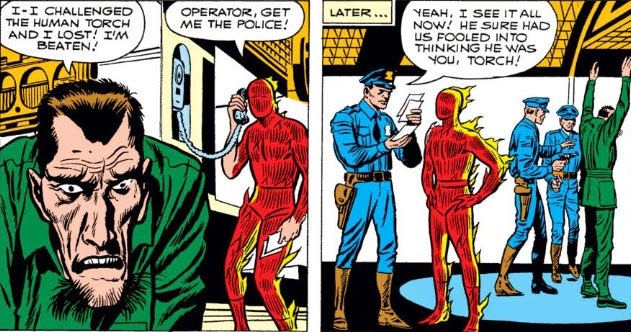 Hey, Stark, answer your phone! 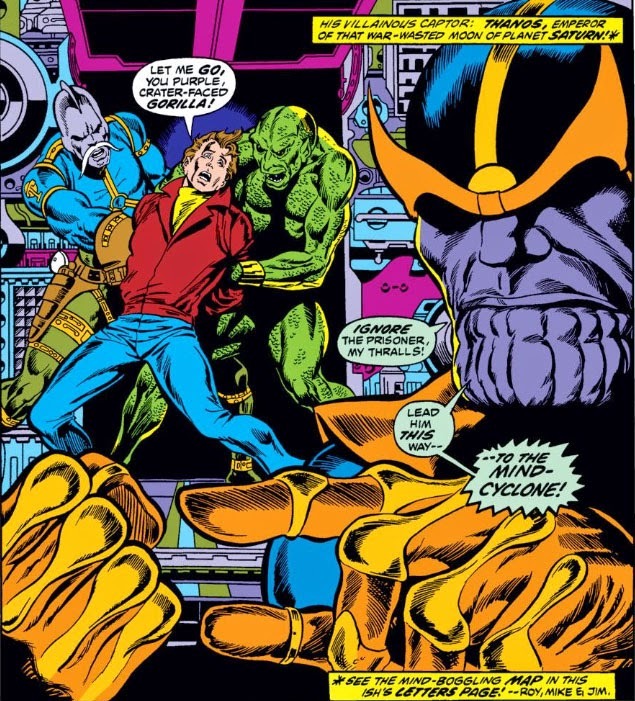 Ultron would like a word with you! 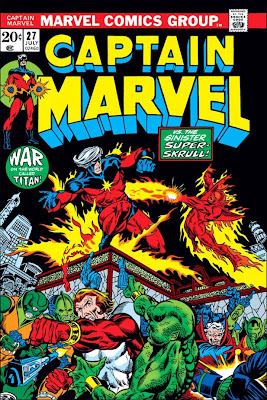 Where Waits The Cosmic Cube! 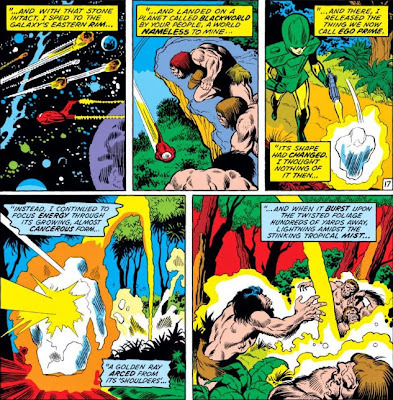 Unfortunately, the numbers of Titan's defenders (a/k/a the "free, fighting, true army of Titan") are low, since Thanos has been quite thorough in conquering his homeworld and eliminating any possible opposition to his plans. Just how low will be revealed in a bit. Our concern for now is Rick Jones, who, when we left him following Mar-vell's victory, was determined to find some answers. 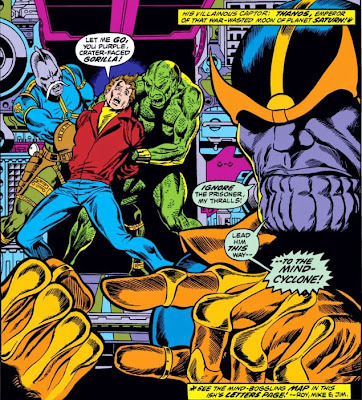 Instead, when he falls into the clutches of Thanos himself, he finds that he'll be the one providing answers, in a unique form of interrogation which Thanos hopes will lead him directly to his goal: a weapon of ultimate power. It's hard to imagine there was ever a time when the flamboyant Johnny Storm wanted to keep his status as the Human Torch under wraps. Yet, around the time the Fantastic Four were facing Kurrgo (the "Master of Planet X"--who else?) in late 1962, Johnny and his sister, Sue, established a residence in Glenville, to coincide with the Torch being given a feature of his own in Strange Tales. 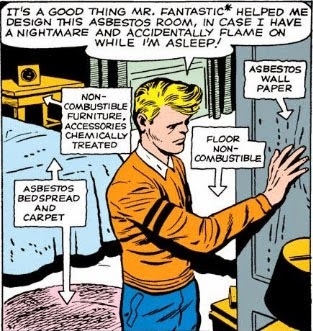 And Johnny Storm, of all people, took a shot at having a secret identity. Apparently the good folks of Glenville aren't all that swift at putting two and two together. 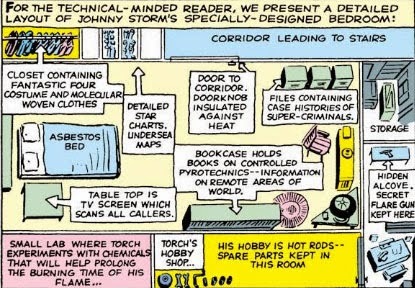 Johnny's face is already well-known as the Torch; in the FF mag published the same month as this story, he's even joining his partners to attend a high-profile dinner engagement in Washington, complete with news and television cameras. 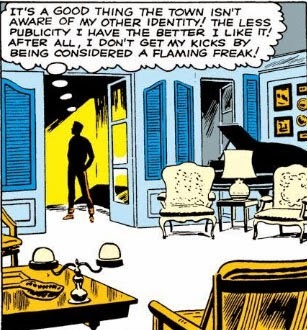 And while the Torch has yet to reveal to anyone else his name as Johnny Storm, he's been overheard referring to Sue as his sister. Regardless, whenever he powers down around anyone in Glenville, Johnny is careful to keep his face obscured in flame. The whole setup here is a head-scratcher, for sure. If you're shaking your head in astonishment at the Torch's admission here, join the club. 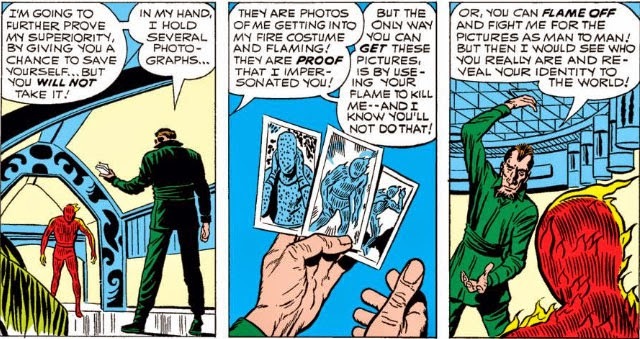 Didn't you always have the impression this kid thought his power was *ahem* fantastic? 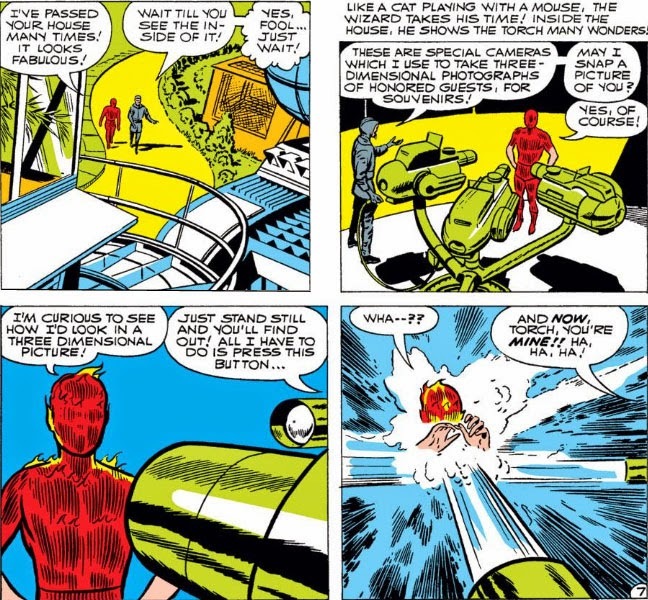 I'm not sure if NASA had "detailed star charts" in 1962, much less a teenager; and why would a guy with a secret identity need a high-tech device to screen visitors? 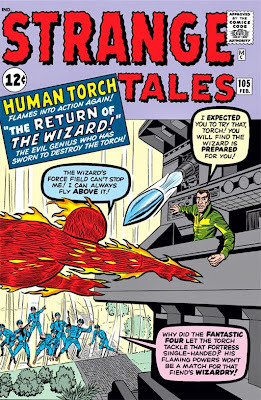 But since we're on the subject of high tech, let's jump to the following issue where none other than the Wizard makes his first appearance. Unlike the deadly menace we know the Wizard will one day become, our budding villain in this story has pretty much everything he could want--fame, wealth, and, it goes without saying, intelligence. Why would this man seek out a life of crime? And so the Wizard is about to get his first taste of prison life, and we know in hindsight that he'd better get used to it. 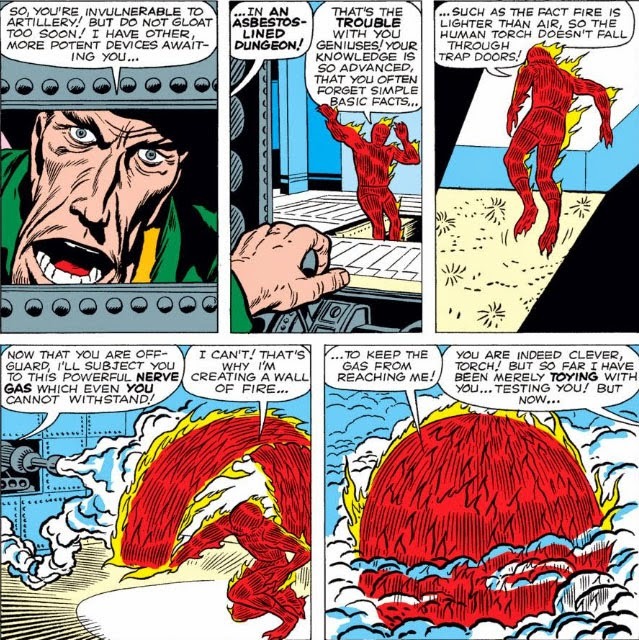 But a prison cell isn't likely to hold a guy with the smarts of the Wizard--and when we catch up to him again, he'll make a stand at that high-tech estate of his and set his sights once more on his fiery foe. 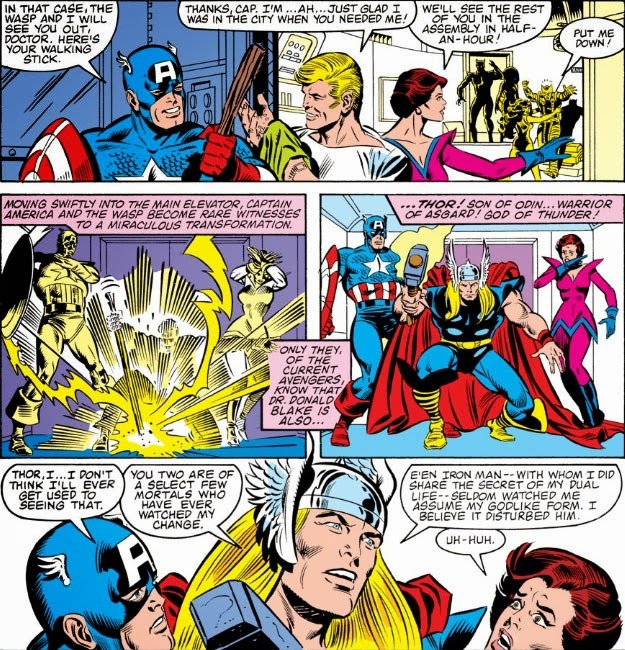 The Curse of the Black Widow! The Awesome Attack of Dr. Blake! 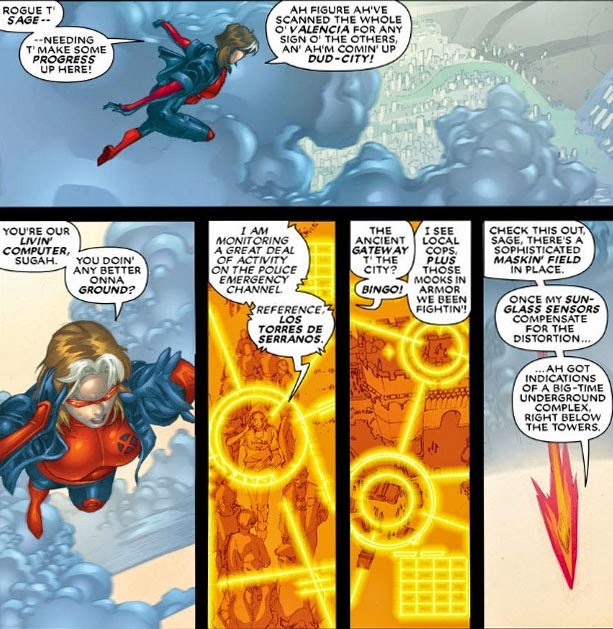 Beware The Judgment Calls of... Ms. Marvel! ...From The Ashes Of Defeat!